Maxi Active Pro-5™gives you support when suffering from recurrent UTI’s (urinary tract infections) and overgrowth of yeast infections. Urinary Tract Infections are caused by bacteria attaching themselves to the cell walls of the urinary tract, causing infections. Yeast infections are caused by Candida albicans, along with a few types of bacteria. Yeast can multiply due to increased pH, heat and moisture, allergic reactions, elevated sugar levels, hormonal fluctuations, and reduction of beneficial bacteria responsible for its management. Antibiotics are probably the leading cause of vaginal yeast infections in American women. For example, if you take an antibiotic to cure your sinus infection, the antibiotic kills the unwanted bacteria in your sinuses, but can also kill the beneficial bacteria, allowing the yeast to take over. Most women have problems with only some antibiotics, others get yeast infections every time they take them. The solution is to reestablishing the healthy bacterial organisms, thus putting nature back in control to eliminate as well as prevent future out breaks of yeast and UTI. To accomplish this Maxi Active Pro-5™ has Lactobacillus rhamnosus (providing 5 billon active organisms) supports the adhesion of pathogens to the urinary tract. Joining it is lactobacillus reuteri which supports restoration of healthy bacteria to guard against yeast infections, urinary tract infection, and gardnerella vaginalis. Cranberries contain compounds which inhibit the bacteria from attaching to the bladder wall and wash the bacteria away in the normal cleaning process of the urinary tract. Unlike many low-cost cranberry supplements made from diminished juice extracts, Cranmax® is a nutraceutical cranberry supplement containing the synergistic, full-spectrum activity of the entire cranberry: the fruit, seeds, skin and fully vitalized juice. Maxi Active Pro-5™ contains this patented state-of-the-art extract with its unique, all-natural delivery system called Bio-Shield. That protects its cranberry bioactives from degradation while traveling through the acidic nature of the stomach. It is more powerful and works faster in treating UTI’s than any other cranberry product, without the side effects found in prescription drugs. Maxi Active Pro-5™ capsules are carefully manufactured to protect the live bacteria from degradation. Just because urinary tract and yeast infections are common, doesn't mean you have to live with it. 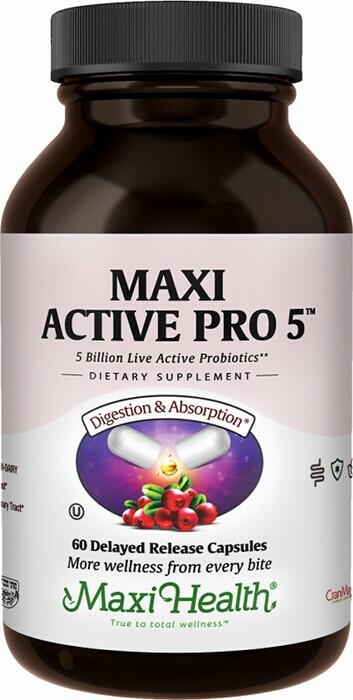 Get Maxi Active Pro-5™! Take one (1) Maxicap™ twice daily before meals, or as directed. For best results take with CranMax Supreme. Other Ingredients: NutraFlora® scFOS™ (Short Chain Fructooligosaccharides), vegetable cellulose (capsule), vegetable magnesium stearate, dextrose. Cran d’Or™ is a trademark of Fruit d’Or Nutraceuticals. My son who is 9 years old has a eczema on his hand. We could not get rid of it with cream with cortisone. Since I started giving him Maxi Active Pro 5 I have seen a major improvement.